Huge investment of 1.38 lakh crores by Industry big wigs like Ambani, Tata etc..
Make in Odisha 2 got its severe head start on Monday raking up over Rs.1.38 lakh crores pumped in by the biz kings of India & abroad. Among the magnates present was RIL Chairman Mukesh Ambani, Aditya Birla Group chairman Kumar Mangalam Birla, Tata Sons chairman N Chandrasekharan, JSPL chairman Naveen Jindal & many other industry captains. Rs 25,000 crore investments were proclaimed by Tata Sons Chairman N Chandra Sekharan in increasing the capacity of Tata Steel’s Kalinga Nagar plant from 3 million tonnes per annum (mtpa) to 8 mtpa. JSPL chairman Naveen Jindal will also invest Rs 55,000 crore to supplement the Angul steel plant’s capacity from 6 mtpa to 20 mtpa by 2030. Anil Agarwal, Vedanta’s Chairman willed to invest Rs 15,000 crore for expansion of its aluminium refinery from 3 mtpa to 6 mtpa. Also, Mr.Aditya Birla spoke on behalf of his conglomerate investing about Rs.14500 crore & Mr.Anil Kumar, SAIL Chairman announcing in investing Rs.41000 crores by CPSU to ascend the Rourkela Steel Plant capacity from 4.5 mtpa to 10 mtpa. In the next 3 to 5 years, Khorda will get its food processing unit by ITC group with an investment worth Rs 550 crore. “Odisha has already become a vibrant state and a preferred investment destination… ITC is committed to working together with Odisha in the socioeconomic development of the state,” ITC MD Sanjiv Puri said. Britannia Industries made its landfall announcing its bakery plant in the next 2 to 3 years. An airstrip coming up in one & a half years with an investment of 500 crores at Dhamra in Bhadrak district leading to an MoU signed by The Dhamra port company Ltd with the Odisha government by The Adani Group. ITEES Singapore inked hands with Odisha Skills Development Authority to emancipate the continuing association. 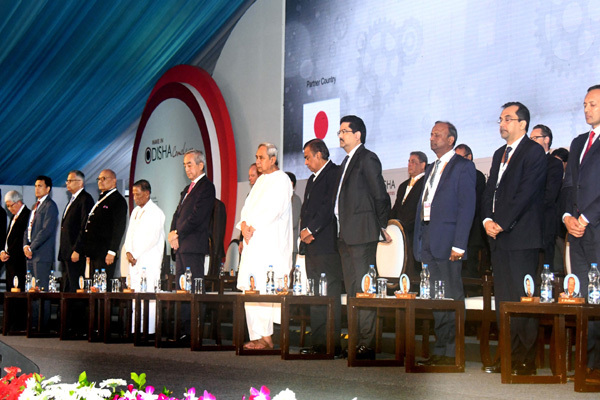 Chief Minister Naveen Patnaik yearned the industry bigwigs in pioneering Odisha into a manufacturing hub of South Asia. “I propose that each of the industry captains present here today, plan a long-term strategy for investment in the state over the next 10 years. Dedicated teams will be appointed by my government to handhold the implementation of your long-term plans. I assure you of unmatched facilitation support from my government,” The Odisha CM said. He further added to raise an optimal biotech system as per the new Biotechnology Policy. The CM said Make in Odisha’s first feature in 2016 was a “huge success” where investment sum was more than Rs 2 lakh crore by 124 companies. This move created to more than 1 lakh employment openings. Make in Odisha’s second feature will over on November 15.